Bribery case closed. But what’s next for Formula One? Early last month, Bernie Ecclestone, the Formula One (F1) Chief Executive, bought his way out of a lawsuit initiated against him regarding an alleged bribe to influence the sale of a stake in F1. Nevertheless, it may soon happen that Mr Ecclestone, aged 83, will not be able to do what in his own opinion he does best – run F1. His successor or, if he stays on himself, must properly address a number of issues F1 is currently facing. This article, as a follow-up to my previous post, provides an overview of the current challenges the highly popular race series must confront. In April, the F1 supremo went on trial before a Munich district court in Germany over allegations that he bribed Gerhard Gribkowsky, a former German banker, as part of the sale of a major stake in the F1 business to CVC Capital Partners (CVC) in 2005. Mr Ecclestone’s lawyers settled with the prosecutors under paragraph 153a of the German Criminal Procedure Code and Mr Ecclestone agreed to pay 100m (approx. £60m) to end his trial. Nonetheless, according to media reports, Donald Mackenzie, co-founder and co-chairman of CVC, is considering removing Mr Ecclestone from his position. This is not only to do with the bribery cases adversely affecting Mr Ecclestone’s public perception as an honest and reliable businessman, but with the commercial challenges F1 is struggling to address. So, irrespective of whether Mr Ecclestone leaves or remains in his position, F1 must fix some problems. This will also require the decision makers to take into account some important legal aspects. Although F1, in addition to the Olympics and football, is the most-watched sport worldwide, it generates considerably less revenue from the exploitation of its television rights compared to the aforementioned sports. For example, F1’s UK television rights fees are less than one tenth of those of the English Premier League. Additionally, international audience viewing figures have dropped by a staggering 30% over the last five years. This drop is coupled with declining figures in race day attendances, which are the result of higher ticket prices. High ticket prices are the consequence of extremely high race fees that local F1 promoters must pay to host the event. Mr Ecclestone is also reluctant to reach broader audiences via new media. The development and sales of online and mobile rights, as well as marketing the sport in the modern world of social media, is definitely an area which F1 should look into in greater detail. Recently, Luca di Montezemolo, the president of Ferrari, expressed his worries to Mr Ecclestone and Mr Mackenzie that F1 was neglecting fans particularly in attracting younger audiences and failing to maintain the interest of sponsors. Despite the trends, the most agonising fact from CVC’s perspective is that, with the new Concorde Agreement in place boosting the F1 teams’ share from 59.6% to 63%, CVC’s profits fell by $137m (£82m) in 2013. At the same time, the teams’ prize money increased 6.1% in 2013 to a record $798m, making it the single biggest cost for CVC. There is no doubt that these concerns need to be addressed as soon as possible. The below solutions, which consider some legal aspects, could help F1 move forward in the right direction. First, the broadcasting rights to F1 should be sold in packages on a platform neutral basis, i.e. media companies have to exploit the rights across all media platforms including television, Internet and mobile on a linear and on-demand basis. Obviously, due to the broadcasting agreements in place, such changes would not happen overnight. However, F1 should slowly move forward and negotiate more complex deals with media companies to make them interested in online and mobile broadcasting to avoid that such rights remain unused. The platform neutral approach would ensure maximum exposure while also providing the broadcasters with programming flexibility. Adapting to the ever developing online world, F1 and the broadcasters could implement different pricing, lock step or revenue sharing mechanisms for on-demand content, live streaming, highlights etc. Geo-blocking would surely help to optimise the revenue of online streaming appropriately. Even if the initial income to be realized from online exploitation would not reach the significance of the money generated from television rights, the wider exposure of the sport, especially among younger fans addicted to the online world, should help drive sponsorship money upwards. Second, lock steps mechanisms could also be implemented in Grand Prix contracts to increase attendance at circuits. For example, the race fee to be paid by the local promoter would be lowered to a certain amount, if a given number of tickets are sold for the race. The reduced revenue from the Grand Prix contract could be offset by demanding higher fees from sponsors due to higher race day attendance and the resulting greater exposure of the sport. Third, licensing F1 brands and content to videogame firms may also lead to a wider exposure and generate further revenues. The longstanding cooperation of Electronic Arts and FIFA could serve as an example to follow. Under the terms of such licensing agreement, the potential videogame provider could maintain exclusive rights to release F1-branded action and management videogames, and the parties could cooperate in further areas, e.g. organisation of online race contests for users. Finally, it is worth mentioning that when negotiating the above commercial agreements, the parties should comply with the requirements of European case law concerning F1. If the current Concorde Agreement was to be renegotiated, the parties would have to especially omit provisions which prevent F1 teams from participating in any other race, competition, exhibition or championship for open wheeler single seat cars. The Grand Prix contracts may not prohibit the organisation of open wheeled cars other than F1 races on the circuit. Concerning media rights, media companies may not be restricted to broadcast open wheeler races other than F1, the duration of broadcasting agreements should not exceed three or five years and the rights should be sold on a non-discriminatory basis. Despite his truly admirable brilliance and astuteness in building F1, Mr Ecclestone should never lose sight of the fact that at the end of the day CVC is here to make as much money as possible. The bribery cases, decreasing revenues and his advanced age may lead to his removal. Unless, as he did in 2005, Mr Ecclestone procures third parties of his choice to buy CVC’s stake in F1 to prevent his dismissal. Regardless of which scenarios happen, lawyers can look forward to the exciting challenge of adapting F1 commercial contracts to the needs of a renewed business model. Mr Ecclestone won a related damages case brought by Constantin Medien in the UK earlier this year. In addition, according to media report, there are also criminal actions against Mr Ecclestone pending in Switzerland and the US. ‘The rising cost of Formula 1’s UK television rights’, The F1 Broadcasting Blog, 26 June 2014. Although local promoters mostly struggle to break even, demand from governments comfortably exceeds the number of racing slots available. ‘Flagged down’, The Economist online, 28 June 2012. ‘Bernie Ecclestone pays his way out of court but F1 position remains in doubt’, Giles Richards, The Guardian online, 5 August 2014. The Concorde Agreement is a contract between the FIA, the F1 teams and the Formula One Association setting out the basis on which the teams participate in the F1 and share in its commercial success. The current seventh Concorde Agreement is valid for the period 2013-2020. ‘Formula One profits stuck in the slow lane’, Christian Sylt, The Telegraph online, 21 April 2014. According to some of Mr Ecclestone’s statements, it seems that F1 gives rights to media companies to broadcast the races by whatever method they wish in their country, but they are not contractually obliged to actually broadcast on all platforms. For example, see the interview with Mr. Ecclestone on JAonF1, 9 June 2011. For the successful exploitation of the currently unexploited rights there are good examples aplenty, e.g. the German Bundesliga, the English Premier League and the Olympics. Case COMP/35.613) and case COMP/36.638. For more details see: Dr Péter Rippel-Szabó: Governance: Legal issues on the sale and running of Formula One, World Sports Law Report Volume 12, Issue 7, July 2014. According to media reports, media mogul John Malone, fashion tycoon Lawrence Stroll and Rupert Murdoch of News Corp, all expressed their interest in the race series. As has been extensively reported in the media, Formula One (F1) Chief Executive Bernie Ecclestone is charged by German prosecutors with paying a bribe to influence the sale of a stake in F1 during 2005. In this post I examine the potential consequences for the governance of F1, should the Munich court find Ecclestone guilty. As well as examining the background to Ecclestone’s trial, this post analyses previous EU case law relating to F1, and its relevance for future F1 stakeholders. In 2006, the private equity firm CVC Capital Partners (CVC) bought shares in the F1 business. Twenty-five percent of the shares were sold by Bambino, Mr. Ecclestone’s family’s trust, while the remaining 75% were bought by a consortium consisting of JP Morgan, Lehman Brothers and BayernLB. Currently, CVC exercises control of the undertaking SLEC Holdings, the holding company of the F1 group of companies, via its ownership of shares of several intermediary companies. Before the 2006 deal, BayernLB had a 47.2% stake in F1, making the German bank the biggest shareholder at the time. German prosecutors now believe that Mr. Ecclestone paid Gerhard Gribkowsky, who was at the time BayernLB’s Chief Risk Officer, a £26.2 million bribe in May 2005, so that Mr. Gribkowsky would undervalue the shares held by the German bank in F1 and facilitate the sale of those shares to a buyer acceptable to Mr. Ecclestone (i.e. CVC). Although Mr. Ecclestone won a related damages case brought by Constantin Medien in the UK in February 2014, his fate will likely be decided in Munich. A first instance judgment is anticipated for September. It is rumoured that even if Mr. Ecclestone were acquitted, CVC would relieve him of his duties. This could have a major impact on F1’s future, as Mr. Ecclestone currently has day-to-day control of F1 and negotiates its most important deals. It is also speculated that Mr. Ecclestone, as he did in 2005, might procure third parties to buy CVC’s stake in F1 in order to prevent his dismissal. Considering these current developments, it is likely that F1 will welcome a new supremo and/or shareholder(s) in the foreseeable future. The new parties will likely face various legal issues when they buy shares in F1 or make business decisions concerning commercial contracts. This article briefly looks into the most important EU case law concerning F1, since some of the findings of those cases may also serve as guidance today. If there were a sale of CVC’s stake in F1, such a transaction might constitute acquisition of control within the meaning of the European Merger Regulation (‘Regulation’), if the combined aggregate worldwide turnover of the undertakings concerned (i.e. CVC and/or the holding companies and the buyer) were to exceed the thresholds set out in the Regulation. In such a case, the European Commission decision on CVC’s purchase of F1 in 2006 provides a good starting point regarding the assessment of the relevant markets and the anti-competitive effects, especially if the potential buyer were to have any sports rights in its portfolio. The relevant product market for F1 can be the market for TV rights to major regular free-to-air motor sports events. As was stated in the CVC/SLEC decision, F1 is broadcast free-to-air. This is essential and irreplaceable for F1, since the involvement of manufacturers and sponsors is directly related to F1’s wide TV exposure. The relevant geographic markets tend to be national due to certain specific reasons, primarily regulatory regimes, language barriers or cultural factors. Although the Commission identified significant market overlap regarding TV rights for major sports events and TV rights for major regular free-to-air sports events in certain countries (Spain and Italy), it concluded that there is no (or only minor) overlap in the market of ‘regulatory issues,’ advertisement at circuits, motor sport teams (manufacturers) and circuits owners/local promoters. The major issue in CVC/SLEC was that CVC, as a result of the acquisition, would have had joint ownership of the TV rights to F1 and Moto GP. This could have led to an increase in CVC’s bargaining power vis-á-vis broadcasters and media companies in Italy and Spain. Additionally, CVC could have employed bundling strategies in other countries. Thus, if the new buyer holds any rights to or controls certain sports events, the joint ownership of such rights/control and rights to F1 must be carefully assessed from the perspective of possible anti-competitive effects. There are also some important legal issues that should be kept in mind while running the F1’s day-to-day operations. 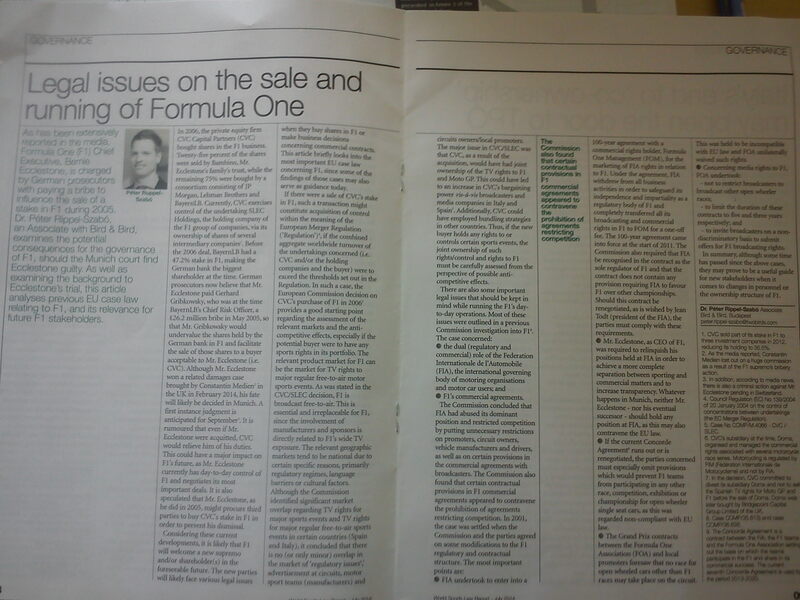 Most of these issues were outlined in a previous Commission investigation into F1. The case concerned: (i) the dual (regulatory and commercial) role of Federation Internationale de l’Automobile (FIA), the international governing body of motoring organisations and motor car users; and (ii) F1’s commercial agreements. (i) FIA undertook to enter into a 100-year agreement with a commercial rights holder, Formula One Management (FOM), for the marketing of FIA rights in relation to F1. Under the agreement FIA withdrew from all business activities in order to safeguard its independence and impartiality as a regulatory body of F1 and completely transferred all its broadcasting and commercial rights in F1 to FOM for a one-off fee. The 100-year agreement came into force at the start of 2011. The Commission also required that FIA be recognized in the contract as the sole regulator of F1 and that the contract does not contain any provision requiring FIA to favour F1 over other championships. Should this contract be renegotiated, as is wished by Jean Todt (president of the FIA), the parties must comply with these requirements. (ii) Mr. Ecclestone, as CEO of F1, was required to relinquish his positions held at FIA in order to achieve a more complete separation between sporting and commercial matters and to increase transparency. Whatever happens in Munich, neither Mr. Ecclestone – nor his eventual successor – should hold any position at FIA, as this may also contravene the EU law. (iii) If the current Concorde Agreement runs out or is renegotiated, the parties concerned must especially omit provisions which would prevent F1 teams from participating in any other race, competition, exhibition or championship for open wheeler single seat cars, as this was regarded non-compliant with EU law. (iv) The Grand Prix contracts between Formula One Association (FOA) and local promoters foresaw that no race for open wheeled cars other than F1 races may take place on the circuit. This was held to be incompatible with EU law and FOA unilaterally waived such rights. (v) Concerning media rights to F1, FOA undertook: a) not to restrict broadcasters to broadcast other open wheeler race; b) to limit the duration of these contracts to five and three years respectively; and c) to invite broadcasters on a non-discriminatory basis to submit offers for F1 broadcasting rights. In summary, although some time has passed since the above cases, they may prove to be a useful guide for new stakeholders when it comes to changes in personnel or the ownership structure of F1.
. CVC sold part of its stake in F1 to three investment companies in 2012, reducing its holding to 35.5%.
. As the media reported, Constantin Medien lost out on a huge commission as a result of the F1 supremo’s bribery action.
. In addition, according to media news, there is also a criminal action against Mr. Ecclestone pending in Switzerland.
. Council Regulation (EC) No 139/2004 of 20 January 2004 on the control of concentrations between undertakings (the EC Merger Regulation).
. Case No COMP/M.4066 – CVC / SLEC.
. CVC’s subsidiary at the time, Dorna, organised and managed the commercial rights associated with several motorcycle race series. Motorcycle is regulated by FIM (Fédération Internationale de Motocyclisme) and not by FIA.
. In the decision, CVC committed to divest its subsidiary Dorna and not to sell the Spanish TV rights for Moto GP and F1 before the sale of Dorna. Dorna was later bought by Bridgepoint Capital Group Limited of the UK.
. Case COMP/35.613) and case COMP/36.638.
. The Concorde Agreement is a contract between the FIA, the F1 teams and the Formula One Association setting out the basis on which the teams participate in the F1 and share in its commercial success. The current seventh Concorde Agreement is valid for the period 2013-2020. Korábbi bejegyzésemben beszámoltam arról, hogy küszöbön áll a prémium sportközvetítési jogok értékesítése EU joggal való összeegyeztethetőségének vizsgálata. Az Európai Bizottság szerint az említett jogok tagállamonként történő kizárólagos értékesítése – az EU céljaival szöges ellentétben – mesterségesen felosztja az egységes európai piacot. Hétfőn Joaquin Almunia, a Bizottság versenypolitikáért felelős alelnöke nyilatkozatban megerősítette, hogy a Bizottság megindította a hivatalos vizsgálatot. A nyilatkozat alapján megállapítható, hogy a vizsgálat tárgyát a hollywood-i kasszasiker filmek jogtulajdonosai (Twentieth Century Fox, Warner Bros., Sony, NBCUniversal és Paramount), valamint a legnagyobb pay-TV szolgáltatók (BSkyB, Sky Italia, Canal+, Sky Deutschland és DTS) között kötött szerződések képezik. E megállapodások a nagy-britanniai, olasz-, francia-, német- és spanyolországi piacon a filmek műholdas és online sugárzásának jogát abszolút területi kizárólagosság alapján biztosítják. Ebben a kontextusban a Bizottságot – a Murphy-ügyhöz hasonlóan – leginkább az aggasztja, hogy az abszolút területi kizárólagosság alapján a médiaszolgáltató a megszerzett jogait a szerződésben meghatározott területen kívül, akár még a másik tagállamban tartózkodó fogyasztó megkeresésére sem adhatja tovább, ilyen fogyasztókkal előfizetői szerződést nem köthet, ill. a műsorok szerződéses területen kívüli megtekintését (pl. kódolás, dekóderek eladásának korlátozása vagy geo-blocking útján) a médiaszolgáltatóknak meg kell előzniük. Emellett a gyakorlatban a jelenlegi szisztéma azt is eredményezheti, hogy amennyiben az előfizető nem abban a tagállamban kívánja megtekinteni az előfizetett tartalmat, amelyben az előfizetői szerződést megkötötte, úgy a kizárólagosság miatt nem fér hozzá ahhoz a szolgáltatáshoz, amelynek ellenértékét korábban már megfizette. Így a Bizottság a vizsgálat során elsősorban ezen passzív értékesítési tilalmakra fog fókuszálni. Végül lényeges kiemelni, hogy a fentiek alapján a Bizottság tehát nem a területi kizárólagosság alapján történő értékesítés létének jogszerűségét vonja kétségbe. Azaz nagy valószínűséggel kijelenthető, hogy a modell – hasonlóan a sportközvetítési jogokhoz – kisebb-nagyobb, versenyjogi megfelelőséget szolgáló “finomhangolásokkal” – várhatóan különösen a passzív értékesítési tilalmak feloldásával – maradni fog. Összességében a sportszektor számára a vizsgálat abból a szempontból bírhat jelentőséggel, hogy a Murpy-ügyben fentebb említett, azonban versenyjogi szempontból részleteiben nem elemzett tétel milyen mértékben kerül kibontásra, illetve milyen olyan megállapításokat eredményez, amelyek a sportközvetítési jogok értékesítési struktúrájának további átalakítást tehetik szükségessé. Update: a bejegyzés kibővített változata a Napi Gazdaság 2014. január 21-ei számában “Filmes jogok: hivatalosan is megindult az EU vizsgálat” címmel jelent meg. In my blog posted back in November last year I reported that the European Commission was going to launch a formal antitrust probe into sales of pay-TV rights to screen premium sports events and Hollywood blockbusters. On 13th January Joaquín Almunia, Vice President of the European Commission responsible for Competition Policy, announced that the Commission opened an antitrust investigation concerning the cross-border provision of pay TV services. It is clear from the statement that the investigation will be limited to the application of the principles established in Murphy to licensing deals between pay-TV operators and the major US film studios. Thus, there is no further scrutiny of exploitation of broadcasting rights in the sports sector (further information available here). According to the statement, the “investigation will focus on restrictions that prevent the selling of the content in response to unsolicited requests from viewers located in other Member States – the so-called “passive sales” – or to existing subscribers who move or travel abroad.” From the sports sector’s point of view it will be interesting whether there will be any findings in this probe which will also require further adjustment of the exploitation system of sports media rights to secure compliance with EU competition law. Should you require more information related to this topic, I would be delighted to answer to your enquiry. Please kindly send an email to peter.rippel.szabo@gmail.com. Küszöbön áll a prémium sportközvetítési jogok értékesítésének EU joggal való összeegyeztethetőségének vizsgálata. Az Európai Bizottság szerint az említett jogok tagállamonként történő kizárólagos értékesítése – az EU céljaival szöges ellentétben – mesterségesen felosztja az egységes európai piacot. Bár a hivatalos megerősítés még várat magára, médiahírek szerint a Bizottság hamarosan bejelentheti a formális eljárás megindítását. A sportközvetítési jogok esetében hosszú ideje alkalmazott szerződéses struktúra lényege – ahogy azt már több írásomban bemutattam -, hogy a jogtulajdonosok (mint pl. az angol Premier League, a német Bundesliga) a közvetítési jogokat egy meghatározott területen (döntő többségében egy tagállamban), időtartamban, platformon vagy platformsemleges alapon a felhasználással kapcsolatban a jogot megszerző médiaszolgáltató(k) részére abszolút kizárólagosságot biztosítva adják át. Összességében ez a modell ahhoz vezet, hogy egyrészt adott időszakban, térben és platformon csak az érintett médiaszolgáltató sugározhatja a szerződésben meghatározott sporteseményeket, másrészt a médiaszolgáltató a megszerzett jogait a szerződésben meghatározott területen kívül nem adhatja tovább, ilyen fogyasztókkal előfizetői szerződést sem köthet, ill. a műsorok szerződéses területen kívüli megtekintését (pl. kódolás, dekóderek eladásának korlátozása vagy geo-blocking útján) a médiaszolgáltatóknak meg kell előzniük. Hatásában tehát az EU által megteremteni kívánt egységes piac az országhatárok mentén felosztásra kerül. A Bizottság és az Európai Unió Bíróságának joggyakorlata már több alkalommal vizsgálta a kizárólagossági klauzulákat és a kapcsolódó értékesítési módszereket. Ilyen volt például az UEFA Bajnokok Ligája, Bundesliga és Premier League ügyek, amikor a Bizottság az említett versenyek közvetítési és marketingjogainak kollektív értékesítését mentesítette, a NewsCorp./Telepiù ügy, melyben a Bizottság a SkyItalia összefonódással kapcsolatban fogadott el kötelezettségvállalásokat, a Coditel-ítélet, amikor a Bíróság a filmes jogok kábeltelevíziós értékesítését vizsgálta, továbbá a Murphy döntés, melyben a Bíróság a Premier League közvetítési jogainak kizárólagosságáról adott iránymutatást. Összességében azonban a kizárólagossági klauzulák megítélése versenyjogi szempontból mindmáig inkább bizonytalan, egységes jogi álláspont eddig nem alakult ki. Médiainformációk szerint a Bizottság a vizsgálat megindításával egyszer és mindenkorra eldöntené, hogy az ilyen abszolút jellegű kizárólagossági klauzulák összhangban állnak-e az európai versenyjoggal vagy sem. Az abszolút kizárólagossági klauzulákat a Bizottság nagy valószínűséggel tiltott versenykorlátozásnak minősíti, így a fő hangsúly az esetleges mentesítésen lehet. Ez utóbbi körben számos gazdasági, piaci, szociális és innovációs tényezőt szükséges figyelembe venni, így különösen a médiaszolgáltatók által megvásárolt tartalom kizárólagosság hiányában való refinanszírozhatóságát, a jogok értéke esetleges csökkenésének hatásait a piac különböző szereplőire, a sportbeli szolidaritási mechanizmus fenntarthatóságát, a labdarúgáson kívüli további sporttartalom eladhatóságát, az eltérő tagállami fogyasztói szokásokat, a különböző tagállamok polgárainak vásárlóerejét stb. A Bizottság az elbírálás során a fentebb említett ügyekben tett megállapításokat minden bizonnyal figyelembe veszi. Így például hangsúlyt fektethet a szerződésekben megállapított időtartam vizsgálatára (pl. a Bizottság a NewsCorp./Telepiù ügyben a műholdas sportközvetítési jogokkal kapcsolatban két éves határozott időtartamot tartott elfogadhatónak), az elővásárlási vagy szerződéshosszabbítási jogokra, az ún. holdback klauzulákra (azaz hogy a szerződés szükségtelenül nem akadályozza-e egyéb jogok értékesítését vagy továbbértékesítését) vagy a terjesztési platformokhoz való hozzáférésre. A vizsgálat közvetlen előzményét képező, 2011 őszén hozott nagy port felkavaró Murphy-ítélet az esetleges eljárás során az említett ügyek közül a legkiemelkedőbb jelentőséggel bírhat (az ügyről rövid összefoglaló itt, részletes elemzés az Infokommunikáció és Jog c. folyóirat 2012/1. számának 26-31. old. megjelent tanulmányomban érhető el). A Bíróság ezen döntése alapján a sportközvetítési jogok műholdas televíziós közvetítésére vonatkozó felhasználási szerződésekben foglalt teljes területi kizárólagosság a szolgáltatásnyújtás alapszabadságába ütközik. Emellett a Bíróság – részben a Coditel-ügyhöz hasonlóan – kitért arra is, hogy versenyjogi szempontból nem a felhasználási szerződésekben rögzített kizárólagosság jogellenes, hanem a médiaszolgáltatók arra irányuló kötelezettsége, hogy ne értékesítsenek olyan dekódereket, amelyek a felhasználási szerződésben rögzített területen kívül lehetővé tennék a mérkőzések vételét, azaz a felhasználási szerződések megtiltják, hogy a külföldi dekódereket azon televíziónézők rendelkezésére bocsássák, akik a műsorokat azon tagállamon kívül szeretnék nézni, amelyre az engedélyt megadták. Továbbá a Bíróság azt is megállapította, hogy a labdarúgó mérkőzés nem, pusztán az arról készült felvétel feldolgozását követően keletkező közvetítés bizonyos elemei minősülnek szerzői műnek, illetve a Bíróság értelmezte a szerzői művek a nyilvánossághoz való közvetítés fogalmát is. A Murphy-ügytől eltérően azonban jelen esetben a Bizottság a vizsgálatot egyrészt valamennyi platformra kiterjesztheti (a Murphy-ügyben csak a műholdas sugárzásról volt szó), másrészt akár több sportág és a filmes jogok is a vizsgálat tárgyát képezhetik (a Bíróság Murphy esetében csak a labdarúgás közvetítési jogairól döntött), harmadrészt most minden bizonnyal a versenyjogi elemzés kerül előtérbe, míg a Murphy-döntésben inkább a szerzői jog és a szolgáltatásnyújtás szabadsága állt a középpontban. Tekintetbe véve az eddig gyakorlatot, az ügyben jogerős döntés – amennyiben valóban hivatalos vizsgálat indul – várhatóan mindhárom EU-s fórumot megjárva a Bíróság előtt és csak hosszú évek múlva fog születni. Végül megemlítendő, hogy a hírek szerint a Bizottság a sportközvetítési jogok mellett egyúttal a prémium filmes jogok – sportközvetítési jogokhoz hasonló – értékesítési módszereit is vizsgálná. Update: a bejegyzés kibővített változata a Napi Gazdaság 2013. december 9-ei számában “Sportközvetítési és filmes jogok: tiltott versenykorlátozást jelent a kizárólagosság?” címmel jelent meg. It has been recently reported that the European Commission is going to launch a formal antitrust probe into sales of pay-TV rights to screen premium sports events and Hollywood blockbusters. 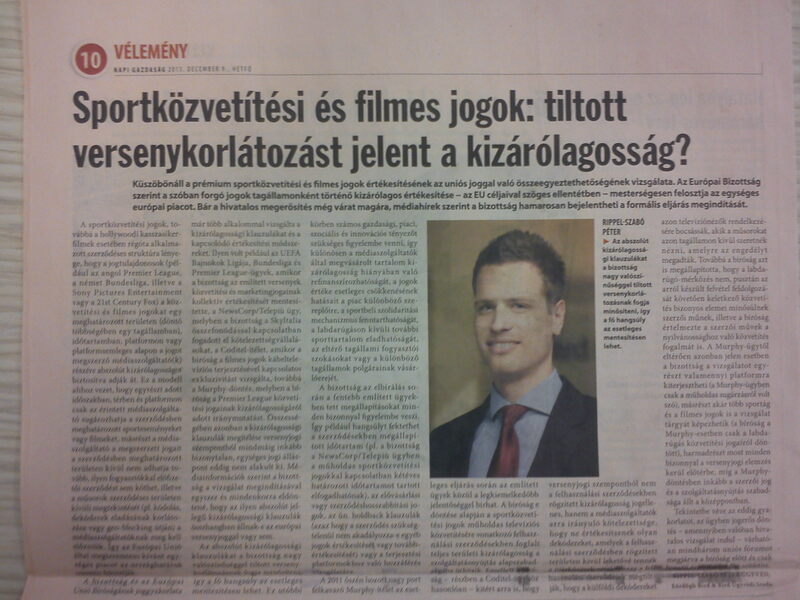 The above Hungarian version of this post describes (i) the reasons behind the potential antitrust investigation; (ii) the current method of selling premium sports rights in Europe; and (iii) the connections of this investigation with previous cases such as UEFA Champions League, Premier League, Bundesliga, SkyItalia, Coditel and Murphy. Should you require more information related to this topic, I would be delighted to answer to your enquiry. Please kindly send an email topeter.rippel.szabo@gmail.com.